Chocolate Chip Applesauce Baked Donuts made in a baked donut pan. Preheat the oven to 350°. Spray one or two 6 count regular donut pans with cooking spray. In a large bowl, mix the flour with the sugar, baking soda, salt, cinnamon, nutmeg and cloves. Make a well in the center of the dry ingredients and add applesauce, vanilla, egg, oil and melted butter. With a mixing spoon or heavy duty scraper, mix everything together just until blended. Fold in the chocolate chips. 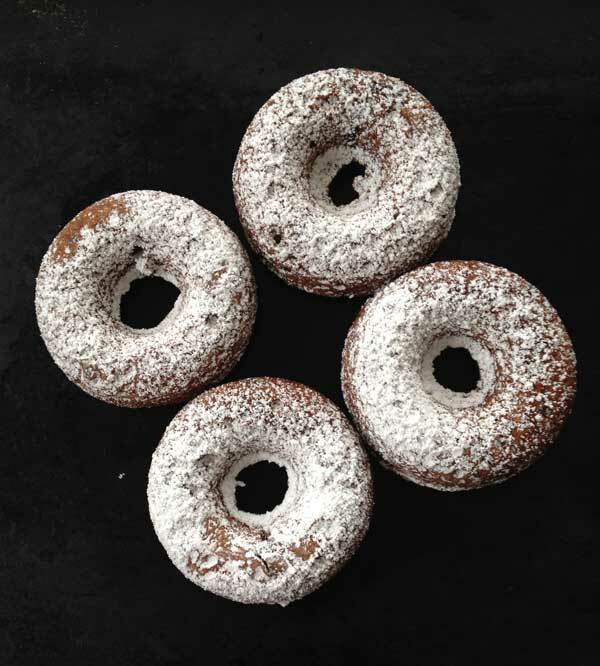 Spoon a generous two tablespoons of batter into each donut ring (batter should not quite reach the top). Bake donuts for 12-14 minutes or until donuts spring back when touched. Flip from the pan while still warm. Let cool completely and sift powdered sugar over the donuts.